Uber is the official rideshare partner of Bridgestone Arena and the Predators. Bridgestone Arena is used year-round for events such as Preds games, concerts, and much more. All Uber pickups and dropoffs at the stadium must be done along 5th Ave. S between Korean Veterans Blvd. and Demonbreun St., southeast of the stadium. You’ll notice Uber flags on 5th near Bridgestone to let you know where to go. You cannot pick up or drop off riders on Demonbreun outside of the Arena. 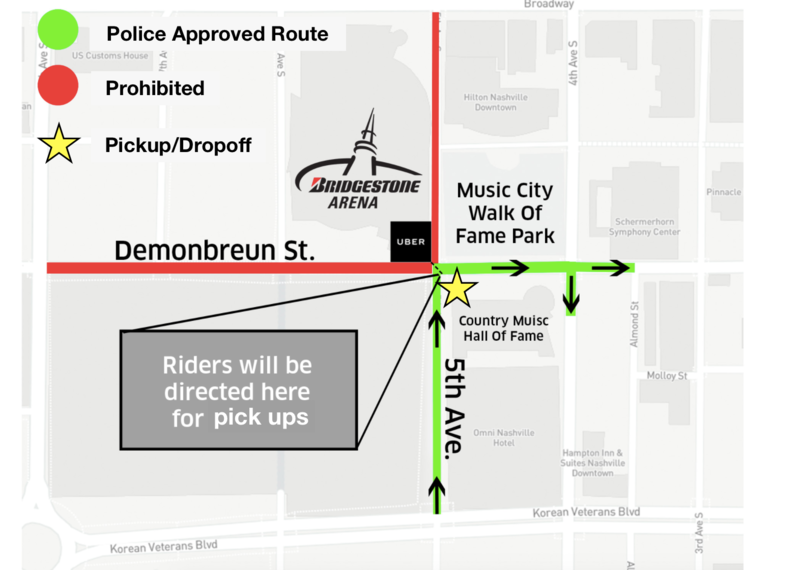 Once you have matched with a rider, be sure to text them to let them know you’ll meet them on 5th Ave. S. Riders will be directed to the corner of 5th Ave. S and Demonbreun St.
Head northwest on 5th Ave. S toward Demonbreun St. Pick up riders along 5th Ave. S between Korean Veterans Blvd. and Demonbreun St.
Stay up to date with all of the events happening at Bridgestone Arena with the schedule below.